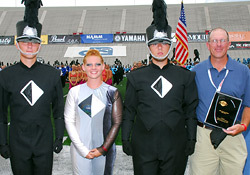 At the 2008 Drum Corps International World Championships on Aug. 9, Spokane Thunder of Spokane, Wash. was recognized as the Most Improved Open Class Corps. Exclusive to the Open Class, the Most Improved award is voted on by all Open Class directors just prior to the start of the week of the World Championships. "It's been a really magical season for us," said Spokane Thunder director Rich Harvey after receiving the recognition on behalf of the corps. "The kids worked so hard and have overcome so many obstacles this season, that gosh, this has just been a wonderful summer for us. We're the little corps that could, and we've been telling ourselves that all summer long. Spokane Thunder at the '08 Open Class Quarterfinals in Michigan City, Ind. As a relatively new group to the Drum Corps International Summer Tour, Spokane Thunder had its start in 2004 marking the return of a competitive drum corps to Spokane for the first time in nearly 25 years. The corps took its first regional tour in 2005 and its first national tour in 2006, when it appeared at the DCI World Championships in Madison, Wis. Spokane Thunder's 7th place ranking at this year's World Championships is the group's most successful finish to date. "The kids have become the most improved corps just by coming out every day and pushing through every rehearsal and never giving up," said Spokane Thunder brass caption head and program coordinator Nick Golding. "We came to the corps this year as a brand new staff wanting to push the level of excellence, but instead I felt like the corps members were the ones pushing us every step of the way." Photo by Jolesch Photography.